Stocks ended a good week on a high note, as hints of progress in U.S.-China trade talks encouraged investors. When the closing bell rang Friday, the S&P 500 settled at 2,775.60, after rising 2.50% in five days. The Dow Industrials gained 3.09%, to close Friday at 25,883.25. The Nasdaq Composite improved 2.39% to 7,472.41. Wall Street breathed a sigh of relief late last week as Congress passed a bill to keep the federal government funded. President Trump signed the measure on Friday. The development is expected to have a positive effect on consumer sentiment, which may influence the financial markets. During the shutdown, consumer confidence hit an 18-month low. Thursday, the Census Bureau announced that retail sales fell 1.2% in December. This was the largest monthly decline in more than nine years and fell short of expectations. Economists polled by Bloomberg anticipated a small gain. The Consumer Price Index (CPI), the most widely followed measure of inflation, was flat in January for a third consecutive month. Year-over-year, overall inflation is running at just 1.6%. The CPI is one of the key factors the Fed considers when assessing the economy and determining what lies ahead for interest rates. U.S. and Chinese negotiators face a March 1 deadline to reach a deal to extend the current tariff truce. In March, tariffs on many Chinese imports could rise to 25% from 10%. President Trump said Friday that he is open to postponing the March deadline if it appears an agreement may be near. Monday: Presidents’ Day holiday (U.S. financial markets closed). Wednesday: Minutes of the January Federal Reserve policy meeting are released. Thursday: January existing home sales. Friday: Federal Reserve Vice Chairman Richard Clarida speaks in New York. Last week, trade tensions with China lessened somewhat, while the 2nd quarter corporate earnings season started with mixed results. Against this backdrop, domestic stocks experienced sizable growth. By market’s close on Friday, July 13, the S&P 500 was above 2,800 for the first time since February 1. Meanwhile, the Dow was above 25,000, and the NASDAQ had hit a new record. For the week, the S&P 500 gained 1.50%, the Dow added 2.30%, and the NASDAQ was up 1.79%. International stocks in the MSCI EAFE increased as well by 0.16%. We are now two weeks into July, which means the 1st half of 2018 is behind us. As we analyze what may be ahead in the markets, we’ll also strive to understand what has happened so far this year. Domestic indexes had mixed results. At the end of the 1st quarter, the NASDAQ was up by 2.3%, while both the S&P 500 and Dow were in negative territory for the year. Fast-forward to the 2nd quarter’s end, and the Dow was still down with a 1.8% loss between January and June. During the same time period, the S&P 500 gained 1.7% and the NASDAQ added 8.8%. Global trade was a major topic throughout the 2nd quarter. In April, the U.S. proposed $50 billion of tariffs on Chinese products—and China announced its own tariffs in response. The trade tension also extended to Canada, the EU, and Mexico as the U.S. added tariffs to steel and aluminum imports from these countries. While this situation attracted significant news coverage, investors were able to put much of their focus on economic details—such as corporate earnings—instead. In June, the Federal Reserve increased interest rates by 0.25%, which marks the 2nd rate hike so far this year. The Fed gave an optimistic view of the economy and said that two more increases could be ahead in 2018. The labor market stayed strong. In May, unemployment hit its lowest level since 2000. June’s labor report showed unemployment increasing to 4% but for a positive reason: more people reentering the job market. The latest report also showed better-than-expected job growth. Wage increases missed expectations and still have room to expand more quickly. At the same time, their steady pace should help keep inflation in check and interest rate increases continue gradually. More 2nd-quarter data is still to come. Gross Domestic Product may have increased by as much as 5% annually between April and June. That growth rate would be over twice what we experienced in the 1st quarter. We are also at the very beginning of 2nd-quarter corporate earnings season, and analysts predict earnings growth of 20%. Moving into the 3rd quarter, trade will likely continue to be a hot topic, but it’s far from being the only detail worth following. As we gain more information about what happened in the 2nd quarter, we will combine those perspectives with the performance we’re experiencing now. In the meantime, if you have any questions, we’re here to talk. 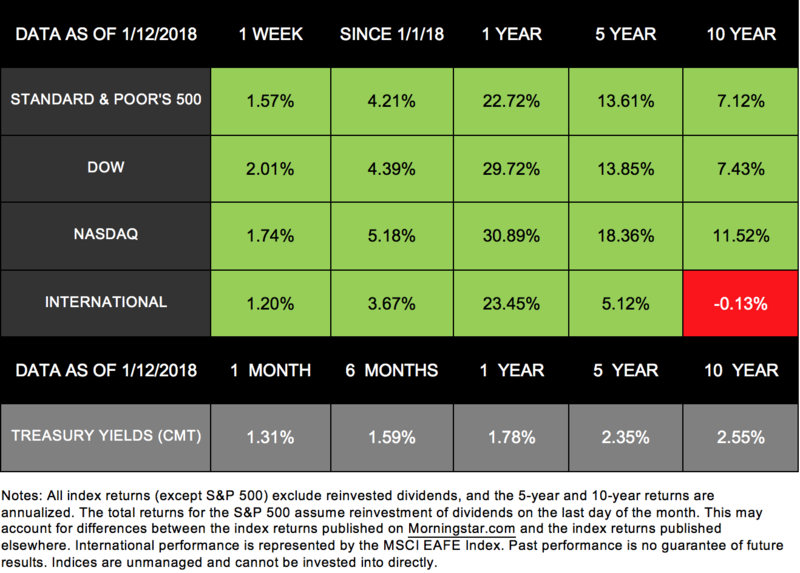 Markets rebounded last week, posting sizable gains and moving back into positive territory for the year. 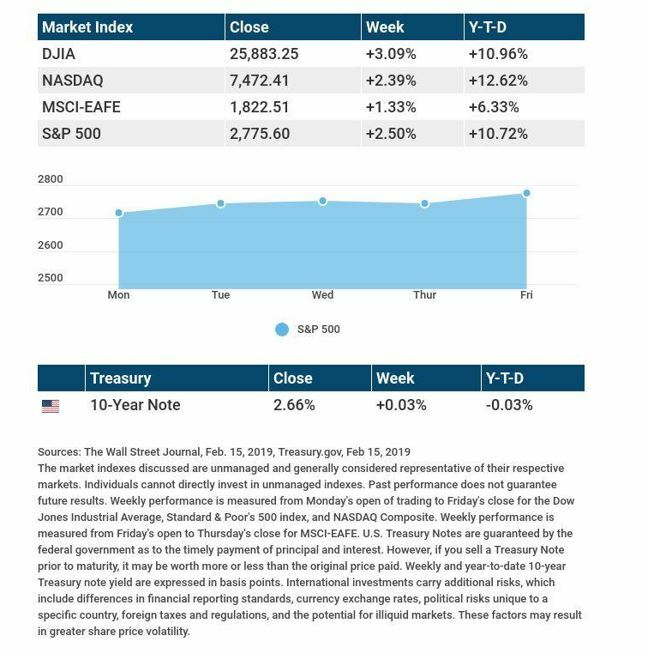 All three domestic indexes experienced their largest weekly growth in years, despite losing some ground on Friday after news of additional indictments in the Russia investigation. By markets’ close on February 16, the S&P 500 added 4.30%, the Dow was up 4.25%, and the NASDAQ increased 5.31%. International stocks in the MSCI EAFE also gained 4.18% for the week. This performance, however, did not come from simple, straightforward increases. Instead, the volatility from recent weeks continued. In fact, the S&P 500 lost or gained at least 1% on 8 of the past 10 trading days. The index only experienced that movement level 8 times throughout 2017. We received a wealth of data last week, and the readings helped deepen our understanding of the economy. The reports showed some mixed results, but much of the information continues to indicate that the economy is on solid ground. Housing starts jumped 9.7%, beating expectations and reaching the 2nd-fastest rate since the recession. Even with mortgage rates increasing and tax reform affecting some buyers’ mortgage interest deductions, the data shows positive news for future homebuilding as well. Consumer price index increased 0.5%, rising 2.1% in the past year. This reading indicates that prices are continuing to rise faster than the Federal Reserve’s target rate. Retail sales fell, dropping 0.3% in part due to slow motor vehicle sales. In addition, negative updates to December’s readings could affect 4th-quarter Gross Domestic Product results. Consumer sentiment beat expectations, coming in at 99.9—its 2nd–highest reading in 14 years. The movement came as tax-cut optimism outweighed stock-market concerns. Many reports show that the economy is strong, so watching for inflation will remain important as the markets keep moving. The combination of growing inflation and a strong labor market means the Fed is still likely to hike rates 3 times this year, with a 4th increase very possible. Looking ahead, volatility may continue, so keep this on your radar. Investors caught between conflicting concerns about missing the bull market and losing money may contribute to ongoing uncertainty. Remember, stock fluctuations are normal. We are here to help you understand what’s happening in the markets and how to position yourself for the financial life you desire. 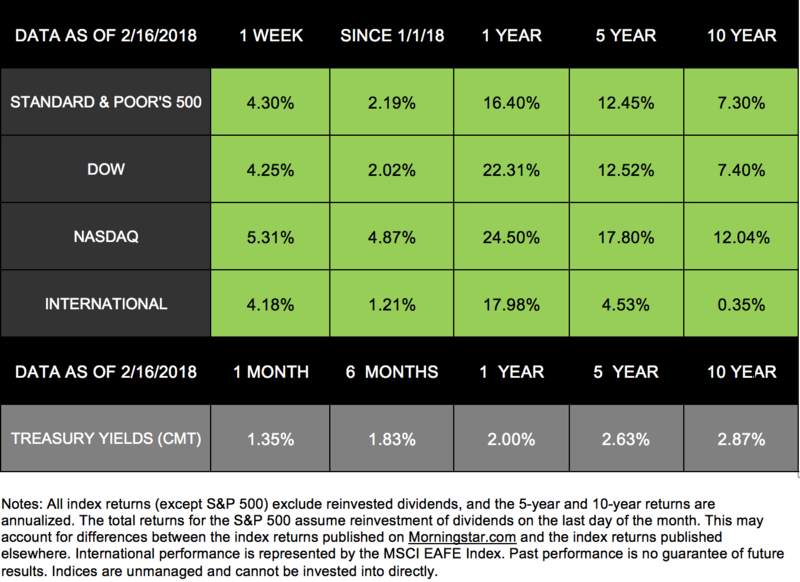 January 2018 is behind us, and stocks posted quite a positive start to the year. In fact, even anticipation of the first federal government shut down since 2013 didn’t derail markets. Several details that came out during the month indicated that a strengthening economy is driving market performance. 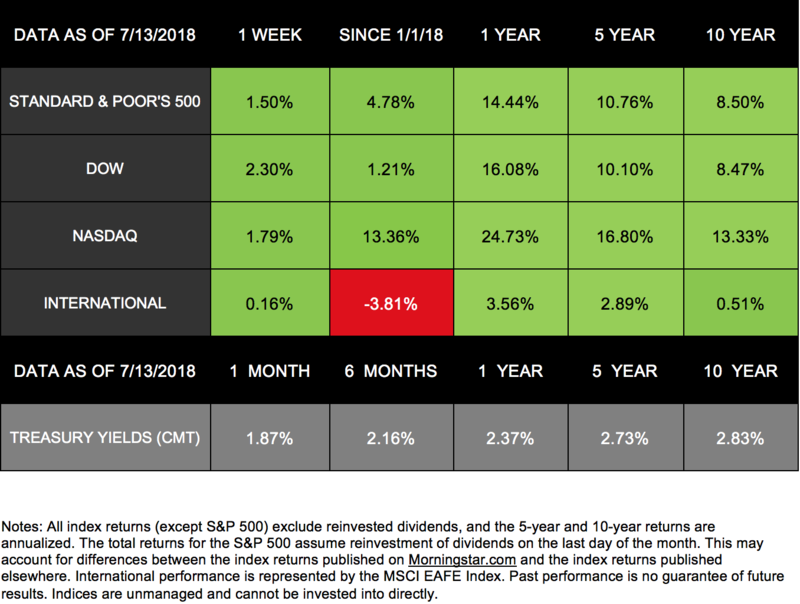 In this video, I will discuss the major economic events that took place last month, and how they could have an impact on you as an investor. As always, if you have any questions or concerns after viewing this video, please don’t hesitate to give us a call at (419) 425-2400, or send us an email. We would be happy to talk with you. Domestic markets continued their strong start to 2018, posting gains across the board for their 2nd week. The S&P 500 added 1.57% and closed at a new record high on Friday. The index just posted its best 10-day beginning to a year since 2003, with a 4.2% gain so far this year. The Dow also hit a new record on Friday and gained 2.01% for the week. The NASDAQ increased by 1.74%, while international stocks in the MSCI EAFE joined last week’s gains, adding 1.20%. By week’s end, we didn’t receive a tremendous amount of economic data. However, the economy did provide details that reveal it continues to pick up speed. In particular, both corporate earnings and inflation appear to be on the rise. Earnings season is upon us, and analysts expect the data will indicate strong corporate performance in the 4th quarter of 2017. Some projections show corporate earnings may have risen 11.2% between October and December last year. According to FactSet, each of the S&P 500’s 11 sectors will likely record growth in both revenue and earnings. We haven’t seen these kind of broad increases since 2011.In addition to gaining insight on last quarter’s performance, this earnings season will provide perspectives on how large corporations expect tax reform to affect them. As we make plans for 2018, this information will help inform our strategies. On Friday, the latest Consumer Price Index (CPI) data came out, showing an unanticipated uptick in core inflation. At first glance, the inflation numbers don’t seem particularly noteworthy. The CPI’s December growth was 0.1%, and its annual rate was 2.1%, which met expectations.When digging a bit deeper, however, you’ll see that the CPI rose at a 2.6% annual rate during the 4th quarter—significantly faster than the Fed’s 2% inflation target. Even the “core” CPI numbers, which don’t include the more volatile food and energy industries, have 2.5% annual growth over the past 3 months. Faster inflation, combined with our currently strong labor market and low unemployment, may mean interest rates will also pick up this year. With this latest CPI data, the Fed will likely increase rates at least 3 times in 2018. Higher inflation may also impact stock performance. When Friday’s CPI numbers first came out, stocks stumbled as some investors worried that economic growth could slow if the Fed raises rates too much. However, the strong corporate earnings data helped demonstrate our economy’s vigor and reassure investors.